SANTA BARBARA, Calif. (CNS) — Amid tragedies such as the devastating mudslides in Southern California and the horrific wildfires that preceded them, “we want to know why” they happen, Los Angeles Archbishop Jose H. Gomez said Jan. 14. “It is not easy. 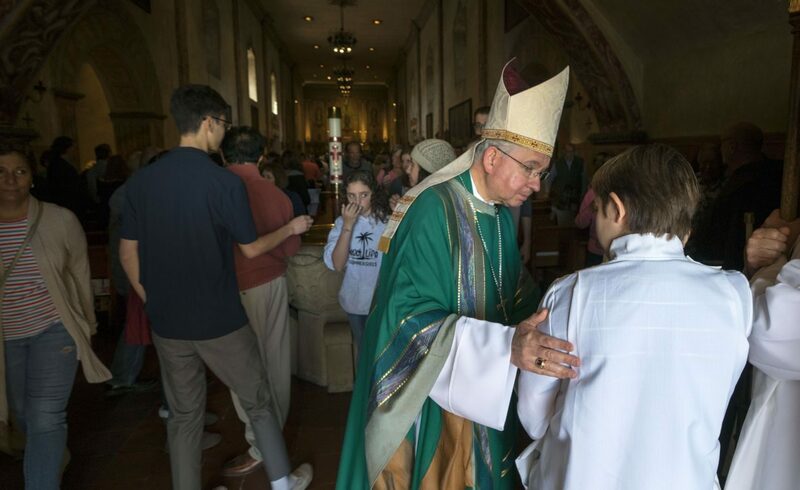 One of the hardest things in the world is to keep believing in God’s love when we see tragedy,” he said in his homily during a Mass with victims of the mudslides at Santa Barbara Mission. Early Jan. 9, the mudslides hit Montecito, a coastal enclave of about 9,000 people northwest of Los Angeles, leaving at least 20 people dead. Three people were still missing as of Jan. 17. Heavy rains had triggered the slides in an area ravaged a month before by wildfires. The Associated Press described a “torrent of mud, trees and boulders that flowed down a fire-scarred mountain and slammed” into Montecito in Santa Barbara County. About 100 homes were destroyed and hundreds of others were severely damaged. One of the fatalities was Roy Rohter, the founder of St. Augustine Academy, a Catholic school in Ventura. The mudslides swept him and his wife, Theresa, from their home in Montecito. Theresa survived. The news website of the Los Angeles Archdiocese, Angelus, reported that Archbishop Gomez traveled by helicopter to Santa Barbara Mission to celebrate Mass. “We gather this morning in this Eucharist to worship God and to talk to him, to pray and to tell him our frustrations, our sorrows. We come especially today — to look for answers to our questions,” Archbishop Gomez said. He described an Angelus story about a couple in their 70s. “They were evacuated during the Thomas Fire (one of the wildfires) and it was only days later that they were able to return,” he explained. “And the place where their house was — there is nothing left. Just ashes and dirt.